Member mission is based on seven truths about God and the relationship we share with God. Our thinking and actions as missionaries are based on these truths. 1. God is always on mission. God is always working with and through us to make the world more loving and just. Teachers helping children learn to read, aid workers distributing food to the hungry, and people reaching out to others in time of need are all signs of God’s mission. Wherever you find love and justice, God is at work. 2. God’s mission has a church. 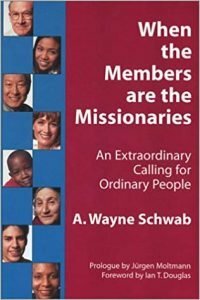 The church does not have a mission. Rather, God’s mission has a church. The church is the visible instrument of God’s mission. The church collaborates with any person or group working for greater love and justice. 3. God wants us to share in God’s mission every day. On Sunday, many of us work in “congregational missions:” participating in the altar guild, leading and teaching church groups, or operating a soup kitchen. “Member missions” are what church members do daily at home, at work, in their communities, in the wider world, and in their leisure to make life more loving and more just. They can vary from rebuilding a broken relationship with a loved one to voter registration to working for more just pay for employees. Member missions take us to the places where congregational missions cannot go to make the kind of real changes that only committed individuals in those places can make. Therefore, we believe that God cares as much about what we do from Monday to Saturday as what we do on Sunday. Sunday is our “heartland” – the place we go to find the power and the guidance we need for the coming week. 4. Spirituality – our relationship with God – needs to go public. Today, churches are often sidelined when critical decisions are made. Its members are not! Our spirituality is often focused on our inner struggles. While we can easily overlook our public lives, that is where we can often do the most for Christ by carrying our Christian values into the world. This is not a matter of imposing our beliefs on others, but rather allowing our faith to guide every facet of our behavior. And, that ultimately translates into our ability to influence the individual, social, and political decisions that affect others. 5. A congregation needs to support its members’ daily missions. Ideally, this support should be the primary focus of a congregation. When a congregation supports its members in their daily missions, it will discover God’s greatest presence and power. 6. We are God’s coworkers; Jesus shares his power, the Holy Spirit, with us. When we choose to do God’s work, we look to Jesus for help. Jesus overcame evil through his teaching and healing. His resurrection is the ultimate victory over evil. We are not alone when we struggle with evil because Jesus shares with us the Holy Spirit, his power over evil. Evil will never have the final say. 7. Our mission is to live the Gospel. We are here to love each other and to share in God’s mission by what we do and say in every part of daily life. We draw on our church’s life and worship – our common life and prayer – for the support, guidance, and power to do God’s work. The more we see all we do as part of God’s mission and the more we believe God is helping us all the time, the more God can help us and the more effective we will be.